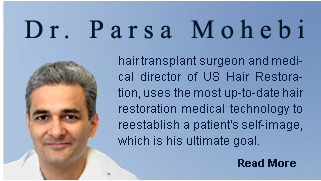 Parsa Mohebi Hair Restoration specializes in hair transplants and medical hair loss treatments for men and women. It is a well proven fact that hair transplantation is the only permanent treatment for hair loss. Parsa Mohebi Hair Restoration's goal is to provide quality hair restoration using the most advanced hair transplant techniques. Parsa Mohebi Hair Restoration's medical director, is actively involved in all steps of evaluation, diagnosis and treatments in hair loss patients. His hair transplant surgeries provides the most natural and undetectable results. Dr. Mohebi is an active member of the International Society of Hair Restoration surgery and is involved in several clinical and scientific researches on hair growth and multiplication. He is currently collaborating with other academic centers to improve the standards in the field of hair restoration. Here at the Parsa Mohebi Hair Restoration, we are dedicated to your better education and understanding of hair loss and hair restoration techniques and methods, including hair transplants, medications and other new findings in our Hair Restoration Web Log. Free consultation with scalp and hair examination to determine your hair loss type. Scalp hair transplants using exclusive Follicular Unit Transplants (FUT). Eyebrow or body hair transplants. Treatment of scalp hair loss using body hair. Detailed education on hair loss, its causes and individual treatment methods. Call us or go online today to set up your free consultation.